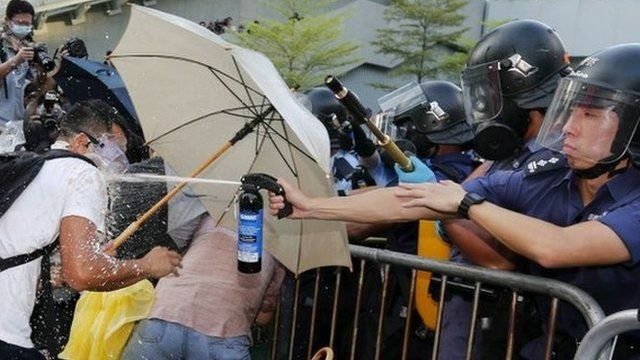 Clashes at Hong Kong Occupy protest Jump to media player Police have used tear gas and pepper spray to disperse pro-democracy protesters outside Hong Kong's main government building, after a week of escalating tensions. HK chief: 'End unlawful occupation' Jump to media player A mass sit-in by pro-democracy campaigners at Hong Kong's government headquarters is an "unlawful occupation", the region's chief executive warns. Tear gas used at HK protest Jump to media player Hong Kong police have used tear gas to disperse thousands of pro-democracy protesters near the government complex, after a week of escalating tensions. HK students break into government HQ Jump to media player At least 100 pro-democracy protesters forced their way through a police cordon to break into the government's headquarters on Friday. 'Fighting for democracy' in Hong Kong Jump to media player Thousands of students in Hong Kong have been protesting against plans by the Chinese government to restrict democratic elections. HK students take to the streets Jump to media player Thousands of students in Hong Kong have converged on a university campus to begin a week-long boycott of classes. Police have used tear gas and pepper spray to disperse pro-democracy protesters outside Hong Kong's main government building, after a week of escalating tensions. Students and activists oppose Beijing's decision to rule out fully democratic elections in Hong Kong in 2017. The BBC's Jiuliana Liu says the situation on the ground is "extremely chaotic" and that protesters show no sign of dispersing.